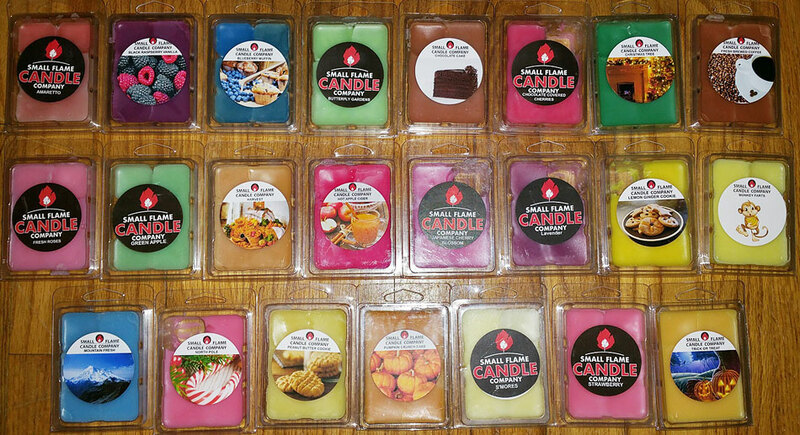 This is a review of wax melts by Small Flame Candle Company, a small business in Ohio that that makes candles and wax melts using phthalate free fragrance oils. The wax used is high quality soy, with a small amount of paraffin added to provide better stability and consistency. Small Flame Candle Company's website is https://www.smallflameco.com, and they can also be found on Facebook. A yummy sweet almond scent with a cherry note and maybe a little bit of rich vanilla. It smells like marzipan candy filling. I don't smell coffee or chocolate. A fantastic sweet apple scent with a little cinnamon and caramel. It's not an apple cider scent, and it's not an authentic apple scent either, but it smells great! A nice rich blackberry/raspberry scent with a hint of a warm perfume note, similar to Scentsy Luna or ScentSationals Blackberry Cider. It's not truly a fruity scent but also not a perfumey scent, more like a rich luxurious blackberry or raspberry scented body lotion. Very nice! Melted, there was a little bit of a tartness that I didn't like, but it's still a very nice scent. A very nice but fake blueberry muffin scent. The blueberry is not very strong when melted, and it has more of a sweet vanilla type note, but still quite nice. Notes: Top notes of summer dandelion, refreshing verbena, and soft heliotrope; middle notes of spring meadows, lily of the valley, and weeping willow; base notes of sweet pea blossoms and Kentucky blue grass. This smells like green grass with a hint of floral, just a little sweet but not flowery sweet. It has a bit of bitterness that I don't care for. This is a very nice chocolate scent. It doesn't have that stinky burnt note that some chocolate scents have. It really smells like chocolate cake! I don't smell nuts though. A perfect combination of chocolate and maraschino cherries. This smells like the toppings of an ice cream sundae, or a cherry filled chocolate bar. Decadent and super yummy! But the scent dissipated in under an hour. This is a fake pine scent but not in a bad way. There may also be a hint of something else in the background, like cranberry. Looking at the notes, the cranberry is probably the lime. A nice coffee scent with a bit of a milky note. It's not a burnt bitter black coffee, or a sweet coffee, or really even an authentic coffee scent. But it's quite nice. A fake rose scent with a soapy, slightly bitter note. It's a nice scent, but I'm not a fan of the bitterness. A nice sweet apple candy scent with a smidgen of a marshmallowy and/or slightly caramel note. I smell cinnamon, cloves, a little bit of apple, and maybe a smidgen of nutmeg. Looking at the notes, they're spot on. A nice fall scent. Notes: Pink Japanese cherry blossoms and fragrant mimosa flower petals, with warm base notes of vanilla, Tonka bean, and oriental woods. This smells like a tea rose scent to me, rather than cherry blossom, like a tea rose scented soap with just a hint of bitterness to make it smell a bit more authentic. Nice! This smells like a lovely sweet old-fashioned lavender scented soap. I really like this one! I smell both the lemon and the ginger note, and maybe a hint of vanilla. It has just a bit of a yummy cookie note, it's not overly sweet, and it also has a little bit of a fresh almost kitchen lemon note, or even a hint of lime. Looking at the notes, bergamot is probably the fresh note, as that's a base for many cologne scents (although this is not a cologne type scent at all). It's an unusual scent, and I really like it! This is a very fake banana scent, like dollar store banana flavored candy, but it also has a slight perfumey note. I actually really like it! Notes: Top notes of herbaceous green ivy, Brazilian orange, and Italian lemon; middle notes of Damascenia rose, ylang ylang, and violet; base notes of patchouli, cedarwood, musk, and vanilla. I adore this scent! It smells just like a fresh very slightly herbal bar soap (like maybe an Irish Spring or Gain type fabric softener) being used in a steamy hot shower or relaxing bubble bath. It's not just the soap scent, but that lingering hot soapy scent you smell after the shower or bath. It's a nice clean, fresh scent without being harsh or smelling like a "cleaner". It's absolutely fantastic, and it's like it was made just for using in the bathroom. And the scent lasted all day. I love this scent! It's a sweet sugary candy cane scent with a strong peppermint note and a little bit of vanilla. This really smells like a peanut butter cookie, or peanut butter fudge. It's not overly sweet either. Yummy! This is a pumpkin pie scent with a rich buttery note, maybe a hint of nut, and a smidgen of vanilla. Looking at the scent notes, they're spot on. When melted, this almost has a bit of a peanutty note and smells more like pumpkin peanut brittle. This smells like a rich chocolate chip croissant. It doesn't smell like s'mores, as there's no marshmallow or graham cracker notes. But it still smells yummy! This is a yummy sweet strawberries and cream candy scent. It's not an authentic strawberry scent, but that's okay because it smells great. A nice sweet corn type scent, like corn muffins maybe, with a hint of caramel. Looking at the scent notes, I figured they were going for a candy corn scent, and although this is a nice scent, it's definitely not candy corn.